Published on Tuesday, November 17, 2015. This article appears in the December/January 2016 issue of American Craft Magazine. 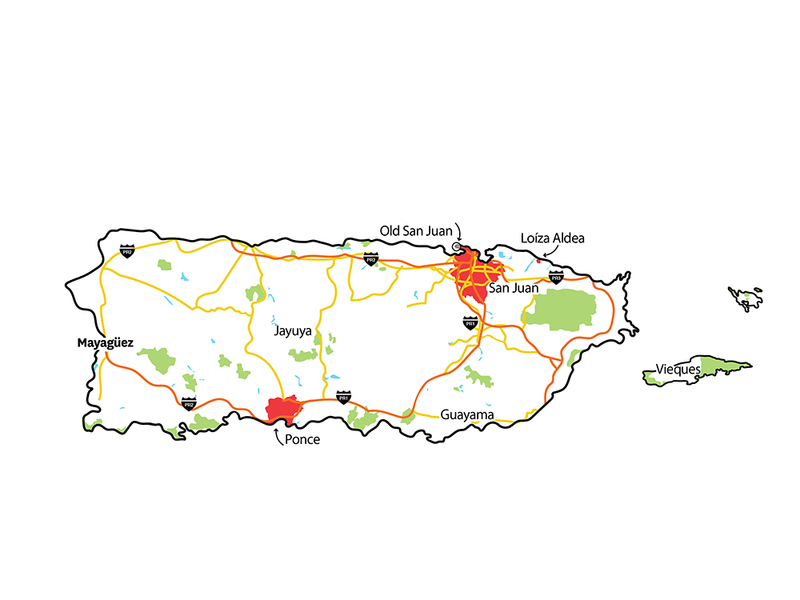 Old San Juan, Loíza Aldea, and Ponce are among the centers of craft in Puerto Rico. In this sunny Caribbean city, traditional crafts remain a contemporary practice. Puerto Rico’s most alluring aspect may be its idyllic beaches, but in the capital of San Juan, the culture is just as rich as the landscape. 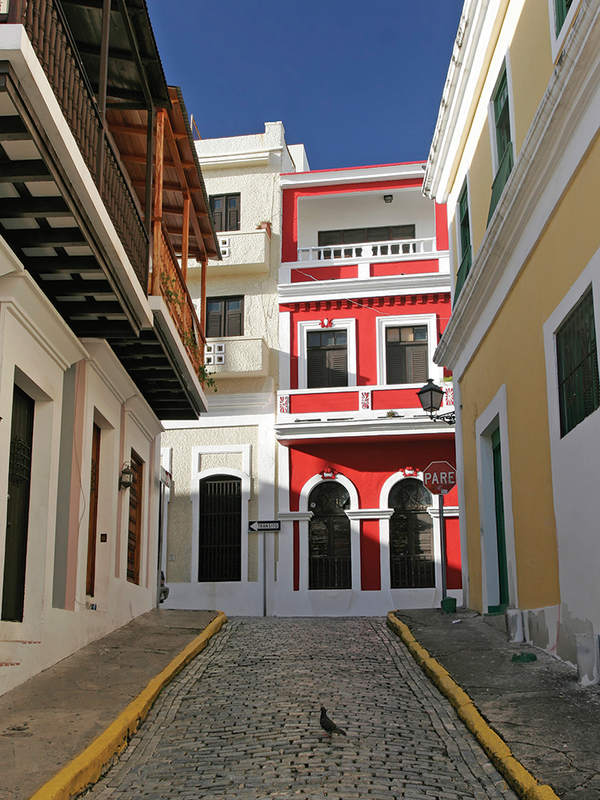 In the historic district of Old San Juan – characterized by colonial-era buildings in a rainbow of colors, charming cobblestone streets, and imposing seaside fortresses – it quickly becomes clear just how much Puerto Ricans cherish their artistic traditions. Work by Puerto Rican artists, such as paintings by 19th-century master José Campeche, are displayed widely in museums, such as the National Gallery and the Museum of the Americas. But those institutions also showcase striking examples of craft, including a permanent folk art exhibit at the Museum of the Americas. 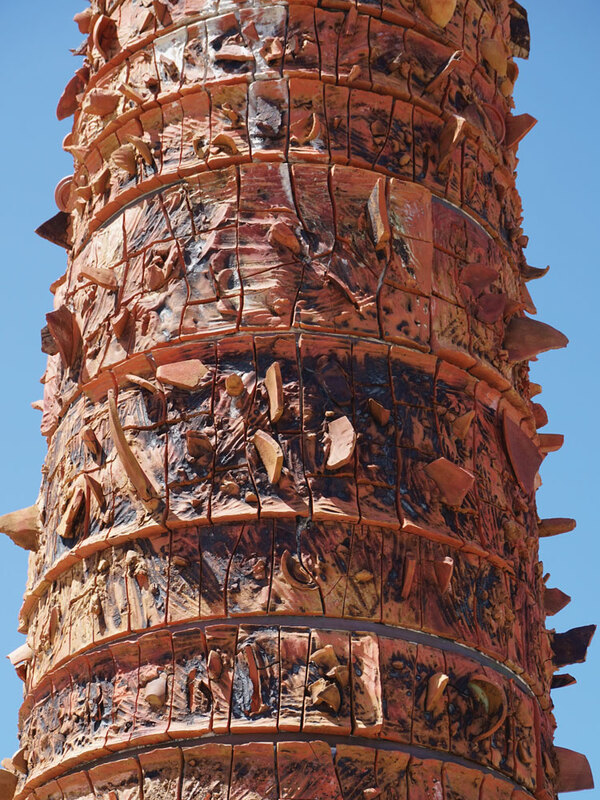 In Quincentennial Plaza, the towering centerpiece is El Tótem Telúrico (Earth Totem) by renowned contemporary sculptor Jaime Suárez. In both fine art and craft, the traditions are varied and vibrant. The richness is in part the result of the many cultural intersections and upheavals in Puerto Rican history. In the early 1500s, the Spaniards colonized Puerto Rico, and for three centuries, San Juan was the major legislative and military outpost of the Spanish empire in Central America and the Caribbean. The religion and culture the Spanish brought had a huge influence on Puerto Rican life, but there were also African traditions brought over by slaves, and aspects of the indigenous Taíno culture also survived. 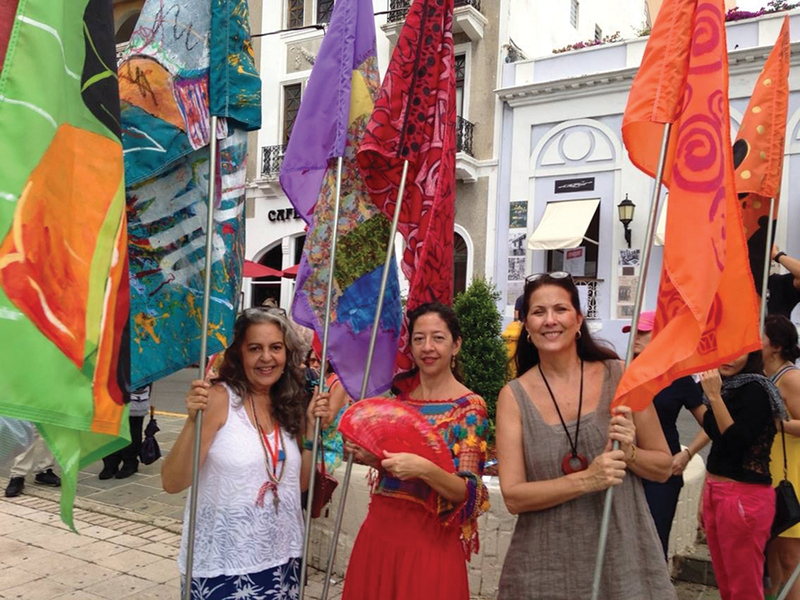 “Artists and artisans are our cultural ambassadors,” says Pavlova Mezquida Greber, a museum consultant and former director of the Crafts Development Program, a government initiative that supports artisans. 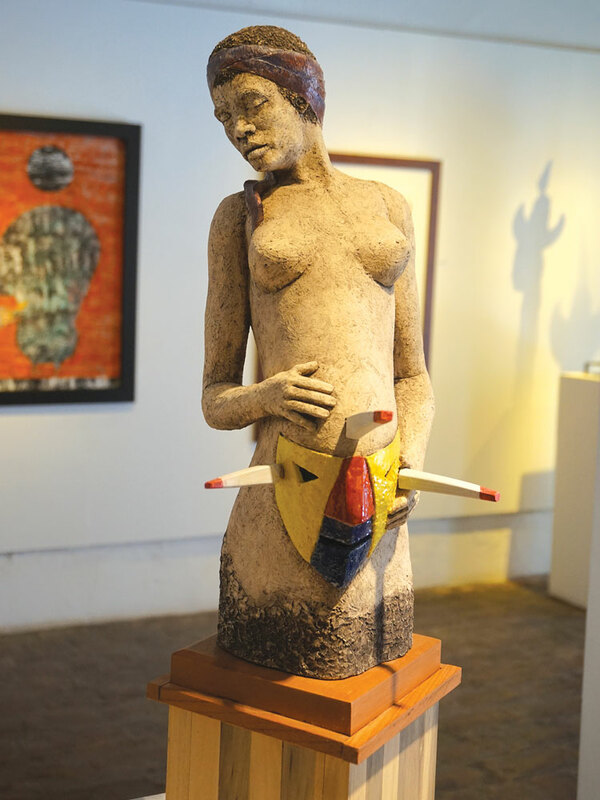 Puerto Rican artists have received international prizes and invitations to teach abroad, and many university and government-sponsored programs offer training where artists can learn crafts such as ceramics and woodcarving. There’s also government aid for artisans, which allows many of them to live on their earnings selling their work at fairs, such as the Fiestas de la Calle San Sebastián, a popular carnival held in Old San Juan in January. Santos – wooden carvings of saints – are the predominant craft items in Puerto Rican stores and craft fairs, and they are widely produced, mostly in the western part of the country. Drawing on Taíno traditions of carved idols, the Spanish missionaries started this tradition in the 16th century so that the inhabitants could have Christian saints to pray to in their homes. The tradition was passed down through generations, and there are still entire families, such as the Orta family, that are known for their santos. Small versions sell for modest prices in shops in Old San Juan, while larger versions can cost as much as $1,000. 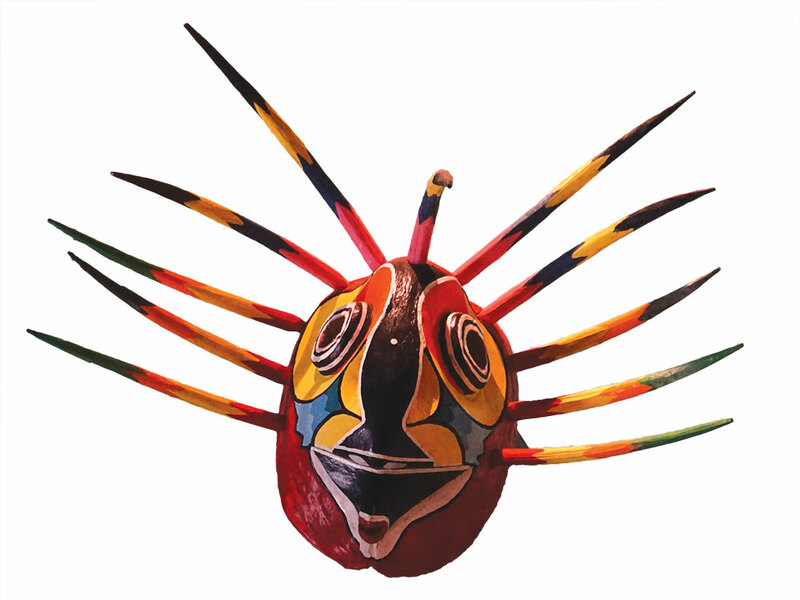 Ornate and frightening papier-mâché máscaras (masks) worn by revelers called vejigantes at island festivals are another popular craft that can be traced back to the Spanish, but the tradition also melded with African and Taíno mask-making rituals. The southern city of Ponce, which is famous for its pre-Lent carnival, is the epicenter of the mask-making tradition. Near San Juan, the town of Loíza Aldea (commonly known as Loíza), whose residents have largely African roots, is also renowned for its masks, made of painted halves of coconut shells. 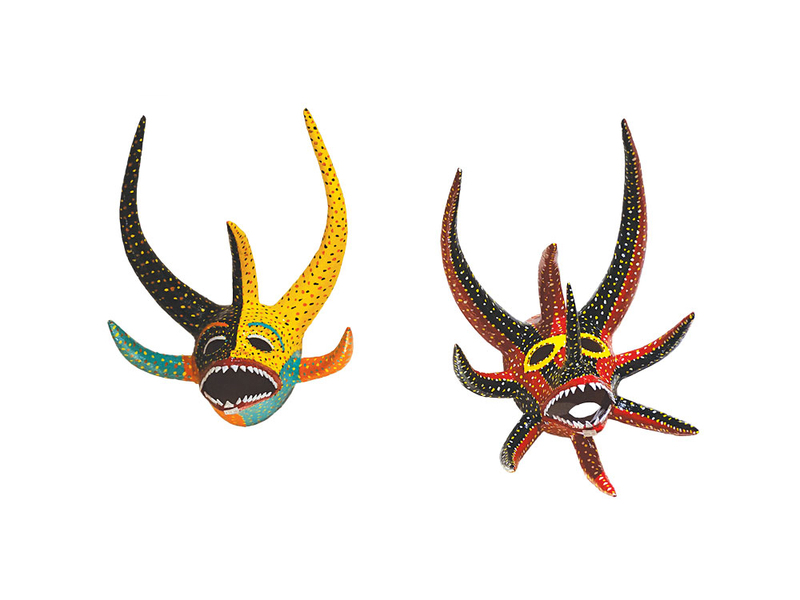 Francisco “Panchi” Tirado merges the mask traditions of Ponce and Loíza with his small coconut masks meticulously painted with bright colors and detailed motifs. 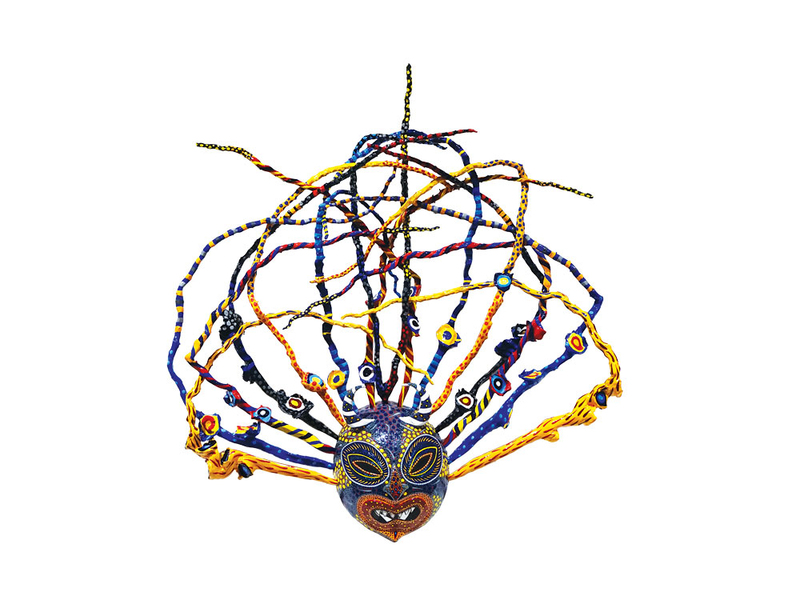 Instead of the papier-mâché horns and sticks that typically adorn masks from Ponce and Loíza, respectively, his masks feature idiosyncratic branches that he paints. Other popular crafts are bird carvings – artist Alex Rios Fernández has been recognized internationally for this genre – musical instruments, ceramics, and jewelry. Some traditional crafts, however, such as woven hammocks and mundillos, a product of Spanish bobbin lace-making now practiced only in Puerto Rico and Spain, are dying out, according to Greber. Mass-produced lace and imported hammocks are much more affordable and maintain a similar level of quality. Tony Amador Fox, owner of Puerto Rican Art & Crafts, carries work by about 60 artisans and 30 fine artists in his shop, which is a destination for traditional crafts in Old San Juan. He notes that Operation Bootstrap, a post-World War II economic program, brought American influence into the country, kicking off a boom in ceramics and reawakening a tradition that goes back to the Taíno. 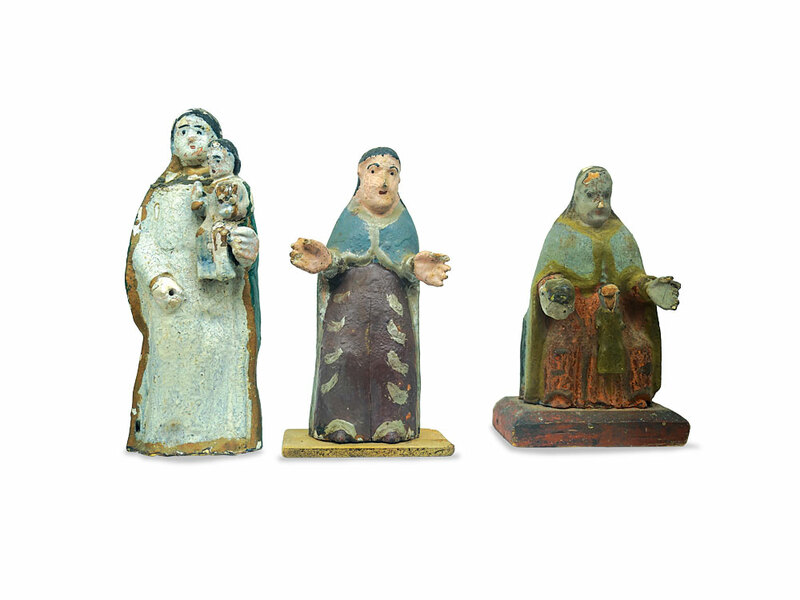 The nonprofit Casa Candina nurtured many ceramic artists in the 1980s. The founding artists “had a high aesthetic, and it was a place people could go to develop their own style,” Greber recalls. The gallery and teaching facility closed in 1992, but the group continues to promote the art form by sponsoring contests and exhibitions. Julio César Díaz’s work combines ceramics and unpainted carved wood, a vehicle to grapple with issues of race in Puerto Rico’s history: In Espíritu del Mangle (Spirit of the Mangrove), leaves formed of wood and clay hide the face of a black man; in Nacimiento de Vejigante (Birth of the Vejigante), an African-style mask from Loíza protrudes from a pregnant woman’s belly. Díaz also loves the history in Old San Juan: Nostalgia (Thinking of You) features images of the colorful stained glass windows in the area. 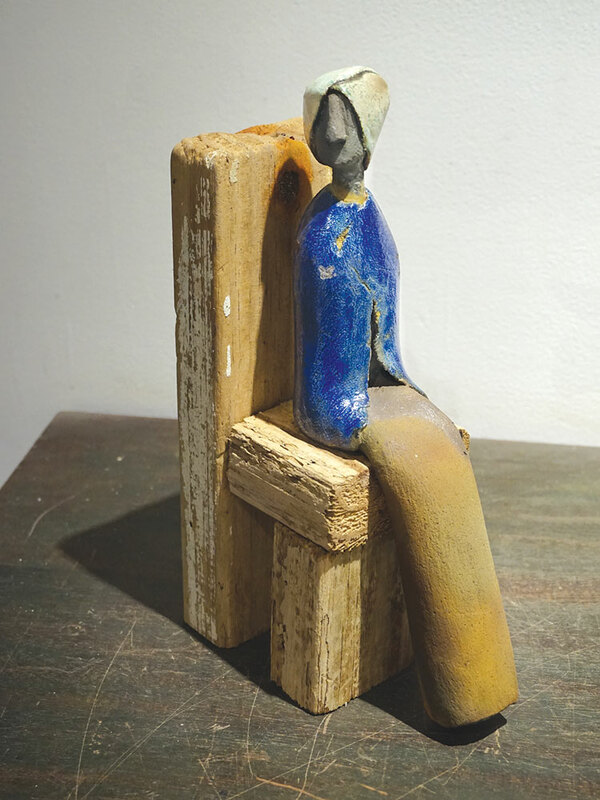 Another noted ceramic artist is Roxanna Jordán, who uses raku techniques to create small, soulful figurines and larger wall pieces, such as The Book of Love. Both Díaz’s and Jordán’s work are on display at Galería Botello, owned by Juan Botello, the son of renowned painter Ángel Botello. The gallery also features a collection of antique santos. Not far from Botello is 3Mujeres (which translates as “three women”), a gallery and boutique opened a few years ago by Yelyn Vivoni, a ceramic artist, Enid Silvestry, a textile artist, and Dafne Elvira, a painter. Vivoni’s pieces often feature organic shapes, some suspended with wire. She spent decades developing her reputation through interior design commissions and selling her work at craft fairs and museum shops. “You have to put your whole heart into your craft if you want to make a living,” she says. 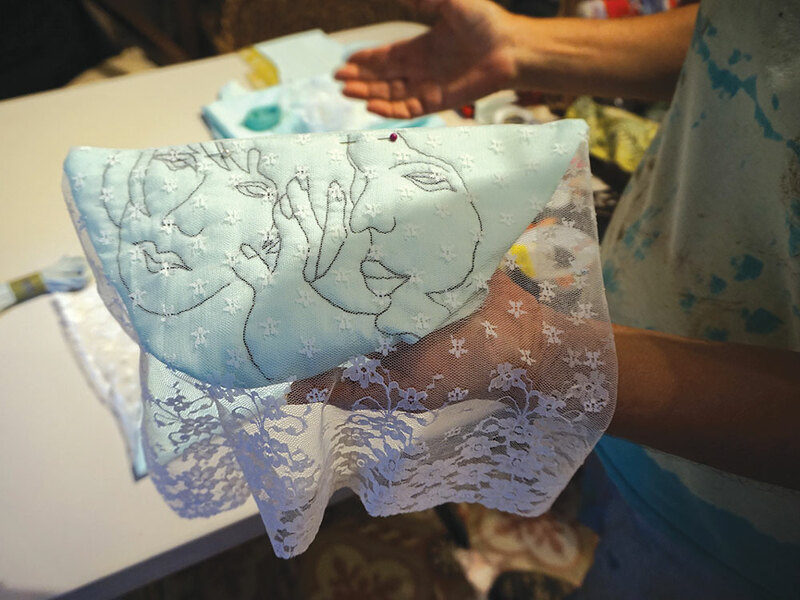 Since so much of the economy relies on tourism, the three artists offer small items – hand-painted purses, printed pillows, ceramic bowls – in addition to their large-scale works. They’ve been pleasantly surprised, though, that the large, pricey pieces often sell, and they have many repeat customers. Silvestry draws and paints brightly colored figures on fabric, then outlines them with running stitches and embroidered text. She’s inspired by music, dance, spirituality, and street scenes in Old San Juan. The messages in her pieces are meant to reflect the lives of women, such as “Estamos hechos para ser amadas, no para ser comprendidas” (“We are made to be loved, not understood”). She learned how to sew as a child. “My mother said needle and thread were the only thing that would focus my energy,” she recalls. 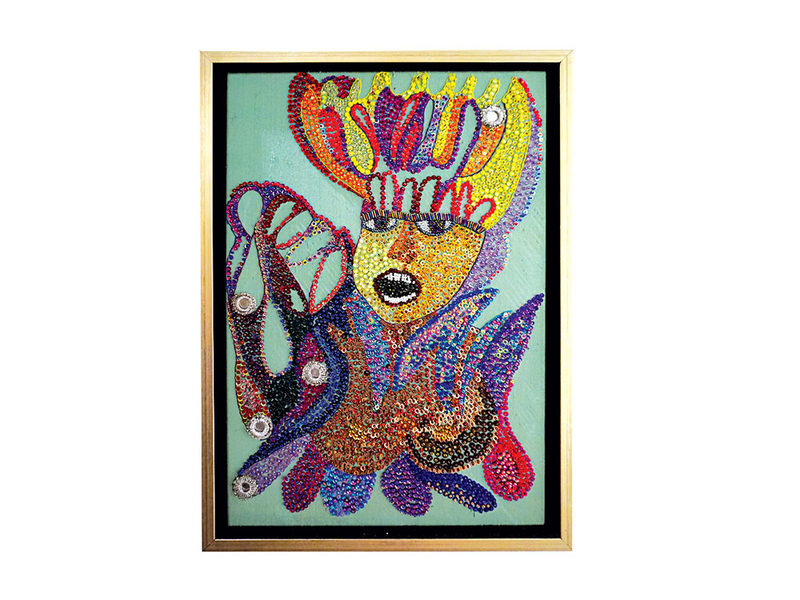 Patricia Wilson, a Puerto Rican native who now lives in Miami, also works in textiles; her carnaval-inspired “paintings,” available at Galería Botello, are made by sewing thousands of sequins and beads onto silk. She was inspired by her mother’s dressmaking skills, as well as the labor de mujer, piecework that Puerto Rican women did for the garment industry in New York City and on the island. As in the work of so many Puerto Rican artists, history is always present. Liz Logan is a Brooklyn freelance writer whose work has appeared in the New York Times and other publications. 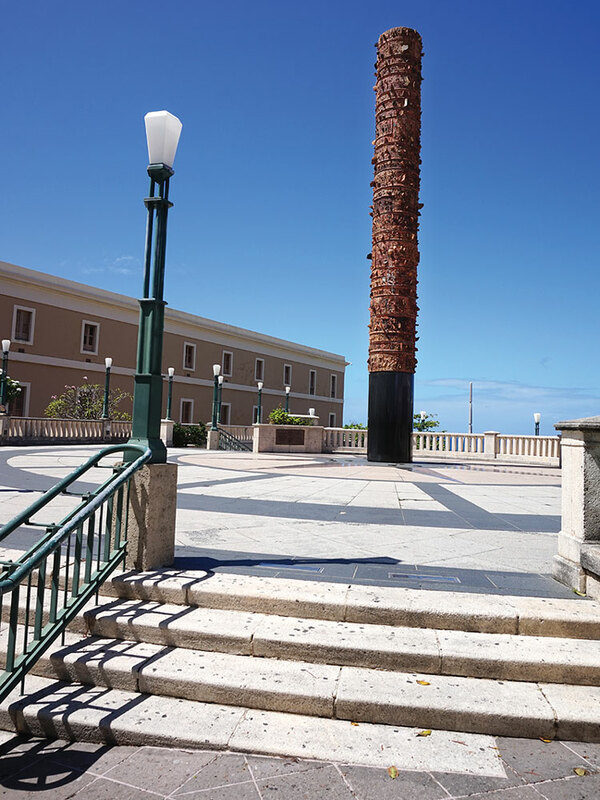 This plaza, which boasts San Juan’s highest point – not to mention an enviable view of the Atlantic – is also home to Jaime Suárez’s sculpture El Tótem Telúrico (Earth Totem). The 40-foot sculpture was built in 1992 to mark the 500th anniversary of the arrival of Europeans in the New World.